Sorry, just remembered I hadn’t put on the washing, which made me realise that I hadn’t emptied the dishwasher and then of course, I made a coffee while I was downstairs but anyway, I’m back with you, lovely reader. Now where was I? Oh yes, lists! Lovely lists. What’s not to like? A way of ordering your mind, of pretending to be organised, of getting stuff done. 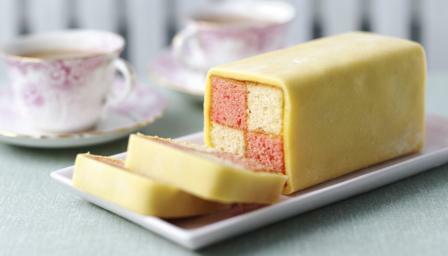 Battenberg cake – don’t mind if I do – tick. Then there are the ‘to do’ lists. Mine always start with, ‘Write ‘to do’ list’ because a ticked item is one step closer to list-completing nirvana. What can I say? I’m a list expert. Which is why, when it comes to this time of year, to the Big Daddy of them all, I come in to my own. I ignore the naysayers, the cynics and the shirkers. Those New Year resolutions will be made, dammit and they will be made with a smile on my face and hope in my heart. For that’s the thing, isn’t it? It’s all about the good intentions; about beginning afresh with renewed energy. I actually start thinking about my New Year’s resolutions around November time but this is mainly because it enables me to put off certain tricky items. Go running? I need new trainers so it will be thriftier to wait for the New Year sales. Finish my tax return? Always more fun in January when everyone else is doing it and we are united in our collective looming deadline panic. You see my problem, don’t you? I am an expert in making lists and resolutions but when it comes to actually fulfilling them, it’s a very different matter. So I thought that this year I would make two lists because two lists are better than one obviously. The first is my wide-eyed, child-like list that my hopeful new year self would like to achieve and the second is the voice of experience. I like the first one better but I know the second one too well. Go running 3 times a week. Buy lots of books, discovering new writers and brilliant ideas which stimulate and entertain me. Write a really brilliant book. Play Wii Dance with my daughter every weekend. Read the books I bought last year, discovering new writers and brilliant ideas which stimulate and entertain me. Write the best book I can. It just remains for me to wish you a happy 2015, dear reader friends – may your lists be concise and all your items achievable and ticked. My name is Helen and I’m a listaholic, is there such a word? There should be, I’m glad we’re united in our love of lists Annie I even have a pinterest board on how to make my planning and lists amazing 😉 It’s just a shame I start with such good intentions and then forget all about them. Fabulous post, which made me giggle. Very entertaining, Annie, and I can completely relate to it. Like you and Helen, I’m a listaholic too. I have a lovely To Do List pad. I diligently filled it out with a page dedicated to each area of my life like home, writing, Brownies, Write Romantics … then managed to lose it amongst an influx of boxes and paperwork. I then started a new list. You’ve guessed it, top of that list was: find my To Do book. Problem was, I did find it a few days ago, ripped out the pages cos I’d done most of it, then promptly lost it again. There’s a post it on my desk saying “find To Do book.” Hopeless case! Good luck and, if you do only achieve list 2, I think that’s pretty impressive!